When I go and visit a new city, I always have a search on the internet to find out what kind of pictures are already made in that particular city. First of all to find out what buildings are nice, secondly to know what is already made, so I might come up new images. On my search for Venice pictures, I found the page of Marco Secchi. Apart from many great pictures he also offers photo walks through the city. We decided to book one of those walks, to learn more about city photography (not really my best type of photography) and to see more of the city from an insider. This was a great idea! We spent over three hours walking through Venice, finding places we would never have found ourselves and having nice conversations about photography. The thing I learned most was to pay attention to details in the cityscape. When I took pictures of cities, I tried to capture whole streets or buildings, Marco pointed me to taking details as well. Small scenes happening, like in this image, or parts of a building or street, details I never paid attention to, but they work well in pictures. Venice is build on a series of islands and is just above sea level. 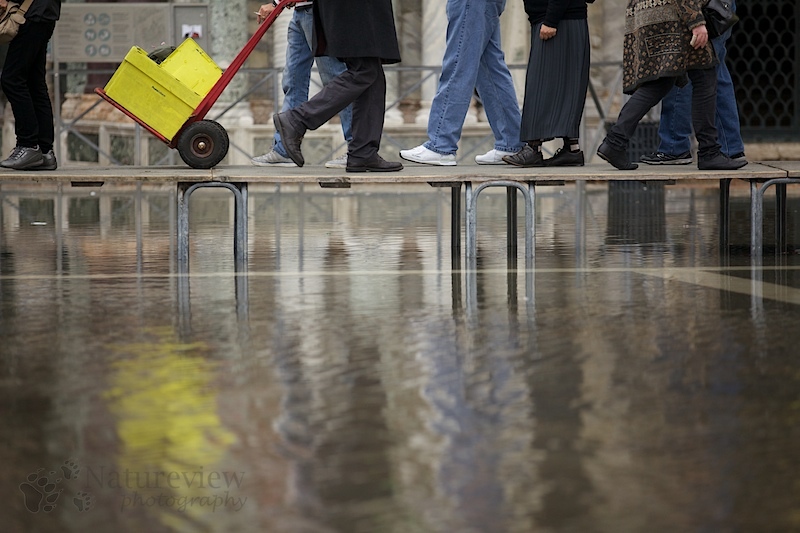 Well, when the sea level isn’t really high… At high tide parts of Venice will flood, like the famous Piazza San Marco in this picture. As this square is partly flooded for 180 days a year at high tide, precautions are taken. Boardwalks are put up quickly, so people can still visit the San Marco Basilica. Here a detail of this boardwalk, I hope you like it.